The Cohesion Jacket and I on Rainier. It's all well and good to blend in with the natural environment when you're playing outside. Muted blues, greens, browns, even black and gray are beautiful. But sometimes, a girl's got to stand out. Red is one of those eye-popping, head-turning colors it's hard not to feel awesome in, even when you're soaking wet and haven't showered in three days. Red can be an intimidating color to wear, but looks spectacular when it's done right. Of course, color isn't the only factor to consider. The Mountain Hardwear Women's Cohesion Jacket is a solid, full featured high performance hard shell with Conduit™ DT to keep you dry and water-resistant pit zips for ventilation. Waterproof, breathable stretch panels on the elbows and back of the jacket make moving around easy and the Ergo hood fits perfectly over climbing and ski helmets. It's constructed with Ark™ 40D nylon ripstop fabric, (the "D" refers to "denier," which measures the density of textile fibers), and is super light at 13 oz. It comes in several colors, including the eye-popping Lava Red. The length of the jacket and sleeves is perfect for me; my rear end and wrists are completely covered. I have long arms and usually have trouble with sleeve length. The Velcro cuff tabs work well to close off the sleeves and I'm glad the jacket was designed without elastic in the cuffs. 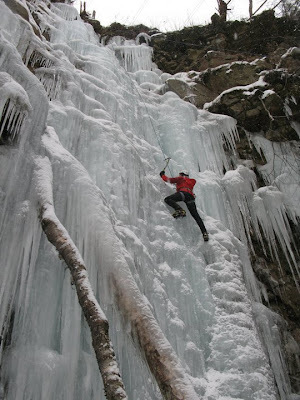 I didn't notice the stretch panels on the back and sleeves until I tried ice climbing in a jacket without them. The panels make a big difference in the jacket's movement. The hood fit securely over my climbing helmet, but is on the edge of being too big. That's a hood problem I'm okay with! The only complaints I have are the positioning of the front pockets and the overall cut. The front pockets are a bit higher than I'd like them to be; the waist belt on my climbing harness covered them completely. I don't expect to need to reach into the pockets while I'm climbing, but you never know! I'd also like to see a more figure-flattering fit. I'll take functionality over form any day, but the jacket is a bit boxy. I found it tight around the hips under all of my layers. In general, the Cohesion and I have been through a lot over the past nine months. 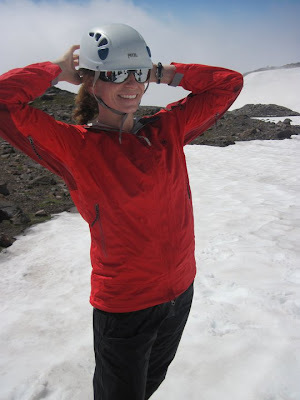 We've climbed Mount Rainier together, we've ice climbed together, and we've been on winter hikes together. The jacket performed beautifully in each of those situations. When the wind kicked up on Mount Rainier, I stayed warm. When it started snowing on the Appalachian Trail, I stayed comfortable. When I climbed an 80' pillar of ice, I stayed dry, and didn't get any ice chips down my sleeves! To me, the Mountain Hardwear Cohesion jacket feels like it's constructed to be a cold weather backcountry shell. It's made to fit over layers. It's definitely breathable, but I wouldn't suggest using it as a rain jacket in warm-weather months or during activities that are likely to make you sweat profusely, i.e. running. For winter activities, it's perfect. I bought the Cohesion with my own hard-earned cash, and as always, all opinions expressed here are my own. What's your favorite hard shell jacket for winter activities? Does the Cohesion sound like it would work for you? Leave a comment! I've got a mountain hardware softshell that looks similar to The Cohesion. I freaking love it. It's got the little thumb holes so no snow into my wrists, hood fits over my helmet and it's super breathable. that sounds like a great jacket! I'm so impressed with everything Hardwear I have. I think every shirt and jacket should come with thumb holes!